A video circulating of a woman claiming to be homeless and staying at one of Trump's hotels for free for nine years is not real, a Trump Hotels spokesperson told BuzzFeed News. A woman's claims in a now-viral video that she has lived in Trump Tower rent-free for up to nine years with the blessing of President-elect Donald Trump himself is not true, a Trump Hotels spokesperson told BuzzFeed News Friday. "There is no validity to the video," said Jennifer Rodstrom, a spokeswoman for Trump Hotels, who answered a BuzzFeed News request sent to a transition team spokesperson. "The woman depicted is not our guest." The video, which first appeared to be posted on YouTube in July, gained traction on Thursday after it was published on InfoWars, a right-wing conspiracy outlet, and celebrated by Trump supporters who said it contradicts criticism that Trump is a bigot. The InfoWars link was shared more than 28,000 times on Facebook. The video was initially tweeted on Thursday by a German website, OnlineMagazin, which frequently posts anti-Muslim content and fake news. In the video, the woman is wearing pajamas and looking out a window that she says is in Trump Tower. The woman, who does not identify herself in the short video, says that she is in Trump Tower overlooking Central Park, where she has been living for free for up to nine years after being homeless. Trump Tower, however, is located at E. 56th Street and Fifth Avenue about two blocks away from the park. The building has restaurants, stores, and condominiums, but no hotel. The Trump Organization didn't immediately return a request for comment on the woman's claims. 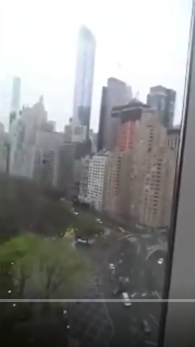 The window appears to be overlooking the southwest corner of Central Park, suggesting she is inside Trump International Hotel and Tower, a different building that sits roughly on Central Park West near W. 60th Street. Donald Trump does not own that building but his organization appears to manage the hotel and condos inside it. 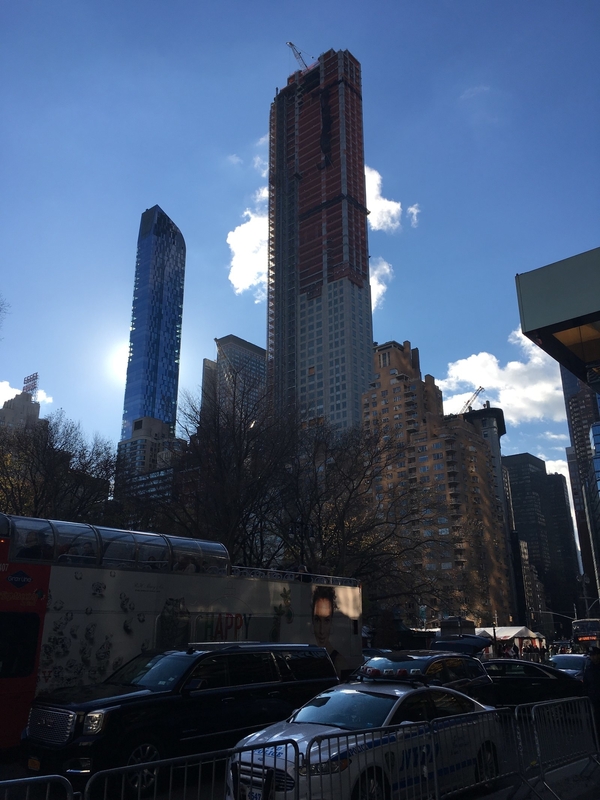 The Central Park South skyline in the woman's video shows a building under construction and not rising above the buildings behind it. On Friday, that building was seen by a reporter still under construction but much higher than the buildings behind it. "I came in here about nine years ago and snuck in the building and just started occupying one of the empty rooms in here," she says in the video. "By the time a housekeeper noticed I was here the next day, she called the manager and they called the New York City Police, who came up here and told me I had to leave or I would be arrested." The NYPD didn't return a request for comment. In the three-minute clip, the woman then says, "they contacted Mr. Trump over the phone and he came down here," where he allegedly told her she could stay. "Not only did he not evict me off the property, he made sure that I ate three meals a day by room service, and that I get a delivery of fresh flowers every week," she said. Considering Trump owns multiple properties and has a stake in hotels around the world, it would be odd that the real estate mogul would have been called by officers to handle a routine police matter at one of his properties. The video posted in July was uploaded by a user named "lee bob." In the description, it appears it was not the woman herself who uploaded it. It is the only video uploaded by that user. The woman in the video then makes an appeal to viewers that "Donald Trump is not a bad guy at all," and that "If it weren't for him I'd be homeless, I'd be dead right now." "I asked them how I am going to pay him back for all this, and he told me I could pay him back whenever I get, which is never." Many Trump supporters shared the video to prove how "mainstream media" falsely painted Trump as a racist and bigot. BuzzFeed News spoke to eight people who said they were condo owners, at least 15 who said they were hotel guests, and one doorman at Trump International Hotel & Tower. Not one person recognized a photo of the woman or had heard of such a case. One resident said that, based on the view in the video, he believed the video was filmed from the hotel section of the building. Another resident said he did not recognize the woman, and was certain he would have noticed her if she lived there. “Have you seen the kind of people who live here?” he said, referring to the building’s predominately white and patently wealthy inhabitants.